This new development will be of interest to those who are always trying to prevent information about their personal life, movements, search history, browser history, etc. being shared without their consent. More specifically, this innovation deals with sent and received messages. The fact is that all text messages, one way or another, are transmitted through an operator, and the operator sees absolutely everything you write in your messages. Of course, it’s highly unlikely that such information would ever be used against you (unless you pose a threat to national security or something similar), but for those in doubt or simply those who are interested, CyanogenMod Inc. has added the ability to securely (or rather, more securely) send and receive encrypted messages to its firmware. Starting from today’s versions, CM’s nightlies will go out using the installed WhisperPush service, which will encrypt messages using TextSecure V2 (using encryption types Curve25519, AES-256, and HmacSHA256) from TextSecure originally developed by Open Whisper Systems; however, unlike the original, this version works with any application for sending and receiving text messages, and the entire innovation is introduced at OS level. However, there is one drawback to ensuring that your text is encrypted and secure from your operator: you need to have the TextSecure-compatible program installed both on your smartphone and on the receiving device at the other end, otherwise your message will be sent as a simple SMS. If this innovation can be implemented in the current version without any issues, it will appear in CM11 builds in the near future. In short, users with the latest versions of Android running CyanogenMod Inc. will be able to securely exchange corresponding messages with each other. 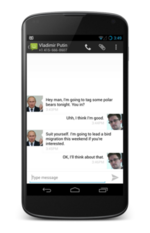 And even better, the TextSecure client is almost ready for iOS, as well.